We talk a lot about how to stay motivated and the importance of reaching a goal weight. Yet sometimes, it still seems like a laborious task. If you’re carrying extra weight, you probably already know there are a myriad health-related reasons to slim down. While it may seem impossible, little steps will carry you bit by bit down your weight loss path to your ultimate goal on the Doctor Supervised ChiroThin Weight Loss Program™. While keeping your eyes on the big prize, it may help you to realize that even small changes in your weight may improve blood sugar, blood pressure, heart health, reduce cholesterol, and decrease your chances of developing diabetes. We’ve shared many motivational tips, but did you know that when you lose 10% of your bodyweight, you are instantly healthier? 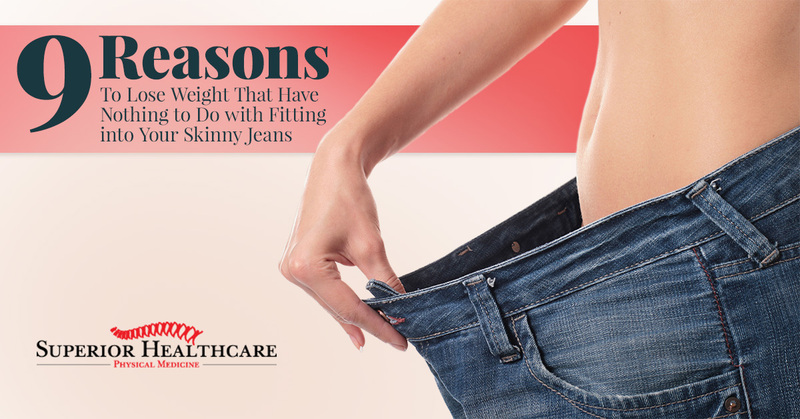 There’s no doubt that dropping weight will make you look and feel better, but there are numerous other benefits that you can realize on your weight loss journey that have nothing to do with how you look in your skinny jeans. Read more: Strategies for successful maintenance after weight loss. Not only does losing weight help relieve arthritis pain, it can also help keep you from developing arthritis—the less you weigh, the less stress on the joints. In addition, recent studies have shown that when you have arthritis and you lose weight, your pain is reduced and your joint functionality is significantly improved. You may not really think about it, but excess weight can put a lot of pressure on your feet, even if you don’t have arthritis. In a recent study, people who had lost an average of 90 pounds found that their incidence of foot pain lowered by 83%. Understandably, since your feet support your entire body, and therefore your entire bodyweight. Relief from foot pain is motivation enough for losing weight. There are numerous ways being overweight may affect your skin, the body’s largest organ. Both skin elasticity and color can be altered by lack of proper nutrition, and a diet high in carbohydrates and sugar can cause pale skin and skin tags. Darkness around the eyes can also signal poor nutrition such as iron deficiency, diabetes, protein anemia, or stress. When you are overweight, your entire system will be out of balance, including the hormones that affect your mood. Losing weight may increase your overall sense of well-being and decrease feelings of depression. Many overweight people suffer from extreme depression, and depression may increase a person’s chances of being overweight, setting up a cycle that is hard to break. A recent study found that older adults that were overweight scored worse on cognitions tests that adults that were at a healthy weight. Past studies have linked excess weight in animals to cognitive decline, but little has been previously understood about the interaction between obesity and the brain. However, new research suggests that being overweight weakens the blood-brain barrier, and this allows substances manufactured by fat to glow to the brain. Researchers also discovered that 12 weeks after weight loss, memory significantly improves. If you’ve ever suffered from insomnia, you understand the benefits on a good night’s sleep. During sleep, your cells are repaired and your brain processes and remembers the day’s events. In fact, the most common prescription for sleep apnea is weight loss. In studies involving people with diabetes and sleep apnea, those who lost a greater amount of weight had the most significant drop in sleep apnea symptoms. And it only takes a weight loss of 5% in obese people to start seeing results. Almost everyone has either heard or read about the global epidemic of type 2 diabetes and its link to obesity. What may be a surprise to many may be how effective losing weight can be at reversing the impact of Type 2 diabetes. In fact, many people can avoid the disease altogether by achieving and maintaining a healthy weight. Studies have shown that type 2 diabetes patients on a restricted eating plan, such as the Doctor Supervised ChiroThin Weight Loss Program™ were able to lower their blood sugar and insulin levels to normal within seven days. If you have type 2 diabetes, reversing the condition and avoiding future complications could just be the best benefit of your weight-loss journey. Many complain that eating a healthy diet is costly, and sometimes it does seem like fast food, junk food, and convenience food is cheaper. However, in the long run slimming your waist can plump up your wallet. When you calculate the cost of medical bills, missed days at work, short-term disability, low-productivity, worker’s compensation, and more, there is a real difference between the financial health of obese people and their healthier-weight peers. There’s nothing wrong with wanting to look good in your clothes, but the harsh reality is that being overweight can take up to 20 years off your life. Happily, reducing your weight by even 5% can have a positive effect on your health and is a great beginning for your transformation. If you are ready to start your weight loss journey, contact Superior Healthcare LLC to find out more about Doctor Supervised ChiroThin Weight Loss Program™.